We know you’ve been to all-you-can-eat Korean BBQ. (Wait... you’ve been to all-you-can-eat Korean BBQ, right!? If not, stop reading immediately and go get some all-you-can-eat Korean BBQ.) And you likely know what bulgogi is. And what kalbi is (it’s short ribs). Or maybe you just point at the pictures and grunt? Either way, what happens when you’re ready to move on from BBQ and enjoy all the other stuff Koreatown has to offer? You need a glossary, that’s what... because there's more to Korean food than just grilled meats. Here’s a quick little primer to help you out. Come summertime, there's nothing you'll want more than the icy cold noodle dish known as naengmyeon. (Seriously: there's crushed ice in it.) 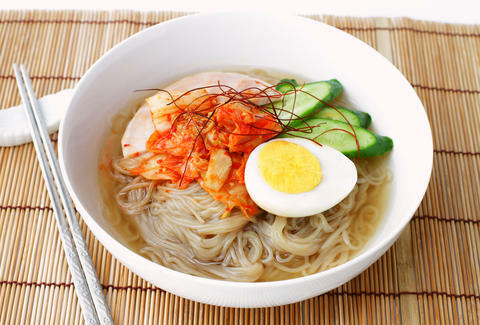 The most typical version is mul naengmyeon, where the noodles are served in cold beef broth and usually topped with egg, cucumber, pickled radish, and Asian pear. 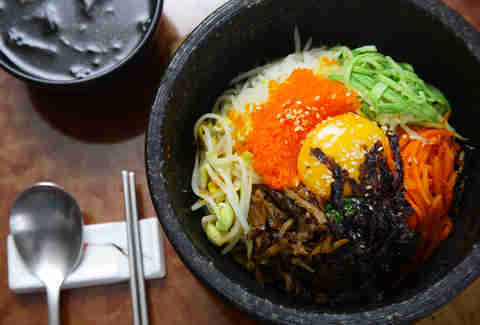 Or you can get the bibim naengmyeon, a drier version tossed in a sauce made from Korean red pepper paste (gochujang). You're eating buckwheat noodles in most versions of the dish, but at Yu Chun the noodles are pitch-black... like the heart of the person who says they don't like this dish. Ahhh... remember when bibimbap was all you knew of Korean food? Neither do we. 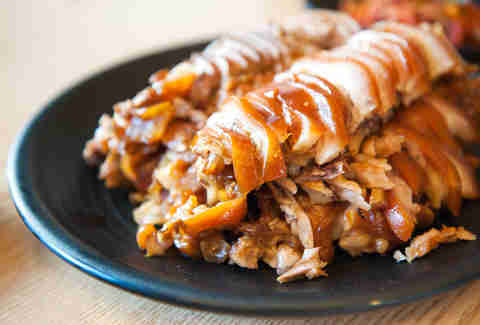 But there's no denying that after Korean BBQ, this is one of the best entry points into Korean food. Rice, meat, veggies, and a delicious sweet & spicy red sauce to bind it all together. Who wouldn't like that? Answer: nobody. And if dolsot bibimbap (cooked in a hot stone pot) is an option, get that, because crispy rice is never not a good thing. 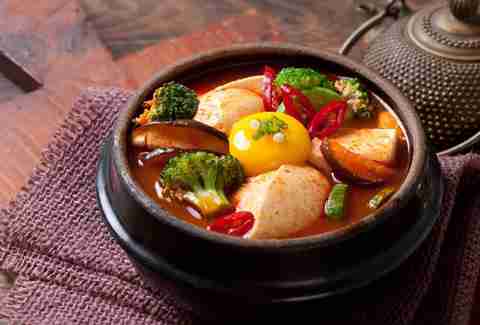 The cornerstone of every Korean meal is the thick, stew-like soup known as "jjigae." Sundubu is one of them, but there are many others, some of which you've likely been given for free at Korean BBQ restaurants. The two most common are kimchi jjigae, which is made with (you guessed it) kimchi; and doenjang jjigae, made with fermented soy bean paste (it tastes way better than it sounds). But the craziest one by far is budae jjigae, a mishmash of hot dogs, spam, instant ramen, and anything else you can imagine (we're looking at you, slices of American cheese!). It was invented in the '50s from leftover food that was sent to feed American soldiers during the Korean War, hence it's nickname, "Army base stew." For a classic budae jjigae, Chunju Han-il Kwan is the spot. 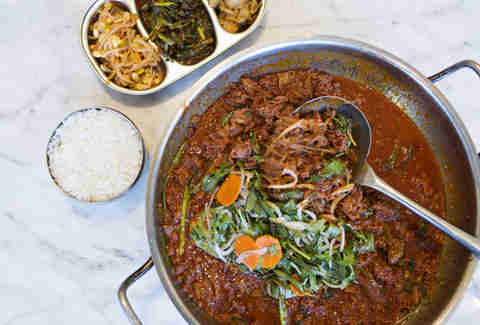 But to really get jiggae with it (apologies, it had to be done), we recommend the "Boot Knocker" at Roy Choi's POT. This cloudy noodle soup, made from boiling ox bones and brisket, is infuriatingly bland... which makes all the condiments on the table incredibly important. Scallions and salt are the first two things you'll want to add, but there's also chili paste (if you like it spicy) and a bowl of rice, which is good for dipping in the broth one spoonful at a time. Han Bat is the go-to Koreatown classic, but for a different take, you'll want to hit up Young Dong. The broth is totally clear, and also it's called Young Dong. When it comes to straight-up soup, the undisputed king of the Korean soups is kalgooksoo -- which literally means knife-cut noodles. The broth can be made with clams, chicken, or pretty much anything, but the result is the same no matter what: intense comfort. At Myung Dong Kyoja, where you can see the noodles being made through the window into the kitchen, you'll get ground meat, scallions, and even dumplings in your soup -- which goes incredibly well with its insanely garlicky kimchee. 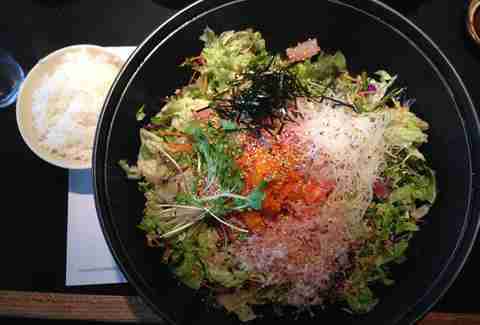 Think bibimbap, but with cubes of raw fish instead of bulgogi. Squeeze in some sweet red pepper sauce, mix it around, and you've got the best example of how Koreans do Japanese food. Look hard enough and you can find lunch special versions of this dish in K-Town for $8 (don't ask us how they do it, we don't want to know). But it's probably worth just heading to A-Won, which not only makes the best version, but whose serving is huge, and worth every bit of the $15 it costs. Short ribs aren't just for grilling! They also make for a deliciously simple soup that is served at more than a few places around town. You'll usually find glass noodles in there, but not much else, to go along with the boiled short rib that they'll usually cut for you tableside. At our favorite place, Oo-Kook, the bone sticks out the top of the bowl, and costs under $10 during lunchtime. Every country in the world has its own version of Chinese food (we're looking at you, orange chicken! ), and Korea is no exception. 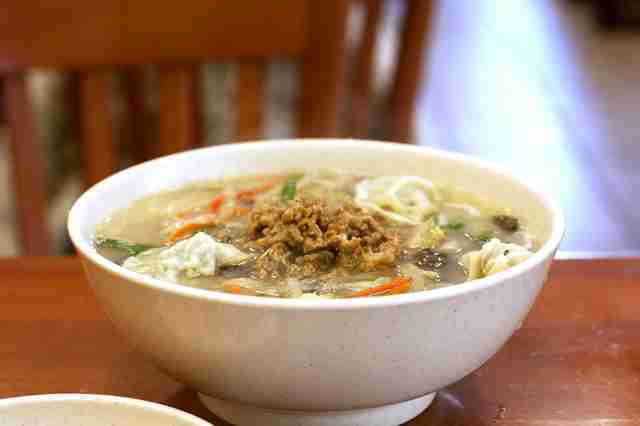 It has its own version of sweet & sour chicken, spicy seafood noodle soup, and dumplings. 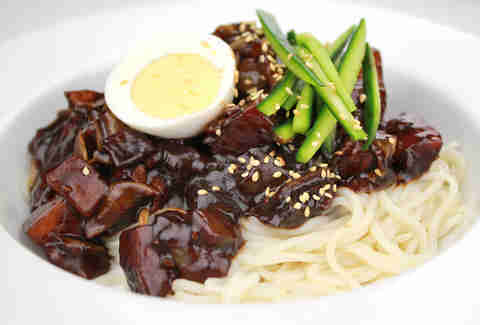 But nothing says Korean-Chinese food like this dish of noodles covered in a black bean sauce with onions (usually), zucchini (sometimes), and meat (if you're lucky). At most places, the noodles are just OK, and the sauce is more like a sludge. But the eight-month-old Lee's Noodles is turning heads with its stellar version. Speaking of dumplings, if you ever see the word mandoo, that's what you're getting. Whether they're in a soup (mandooguk) or served on their own, Koreatown's dumplings show strong. Myung Dong Kyoja's mandoo are great, and you'll always be able to find good versions at Korean Chinese food restaurants (see Lee's Noodles, above). But for the best of the best, you want to go to a specialist, and in LA, that's Myung In Dumplings, aka "The Place Anthony Bourdain Went To." 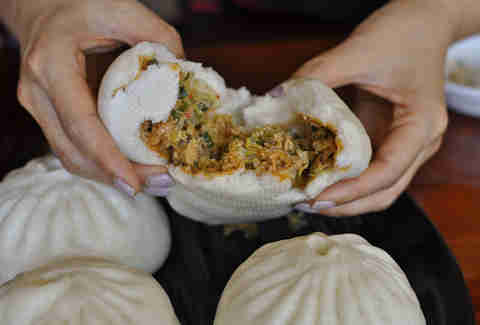 Order the Wang Mandoo, and you'll get these giant steamed buns filled with a mix of glass noodles, pork, and vegetables. There are some pretty great ways to eat Korean pork belly, including grilled on a BBQ or put into tacos (thanks Roy Choi!). But the best, by far, is as bossam -- the giant platter of boiled and sliced pork belly, served with a few kinds of kimchee, raw oysters, tiny fermented shrimp, and giant pieces of lettuce, which you use to wrap everything up in a nice tight bundle for eating. You can find it at a few different places around town, including modern versions at places like POT and Hanjip. But if you've never had it before, there's only one place to go, and that's Kobawoo House. In fact, you should probably stop reading and go there right now. I'm not sure about other versions of this cold noodle in a sweet pickled broth, but the one you get at The Corner Place Restaurant in LA's Koreatown is so legendary that they won't let you take it to go. Some have suggested that the secret ingredient might be 7 Up, but in the end, who cares? You're not making a dongchimi guksu better than the one you'll get at The Corner Place Restaurant. The only thing you do need to know is that it goes great with bulgogi. Once you've graduated from bossam, your next stop should be jokbal, a deboned pig's foot that's been boiled and then roasted. It's sliced and served with a lot of the same side dishes you get with bossam. It might not sound that great, but this is like Korean charcuterie at its finest. Unsurprisingly, there are some terribly rubbery versions to be found all over Koreatown, but the version found at Jang Choong Dong is something every pork fan should try at least once. After bulgogi, galbi is probably one of the first Korean words you learned thanks to places like Chosun Galbee and our general love of short ribs. We told you about galbitang up above. But if you haven't had galbijjim, you don't know what you're missing. 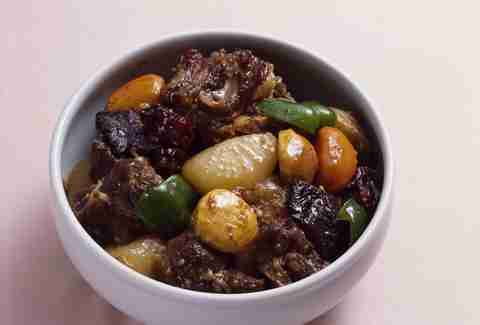 Instead of being cut into slices and grilled, or boiled into a soup, the hunks of short rib are stewed in a sort of Korean version of teriyaki sauce. There are some great classic versions (we're looking at you, Seong Buk Dong), but our favorite is the spicy version at Soban. Not to be confused with a sundae, this is something else entirely and doesn't involve ice cream. It's a sausage made with glass noodles and pig's blood that you'll often find served à la carte with salt and jalapeños, in soup, or sautéed with onions and gochujang (sundae bokkeum). And even though it's fairly mild, and not at all offensive, you probably wouldn't want to eat it in a glass bowl with whipped cream and a cherry on top. Zach Brooks is the founder of Midtown Lunch and host of the Food is the New Rock podcast. His love of Korean food is only eclipsed by... nothing actually. Nothing eclipses his love of Korean food. Follow him on Instagram or Snapchat @midtownlunchLA.